Welcome to the 2014-2015 Pick'em! If you are rejoining us from last year, then you know the drill. For the rest of you, hi. Welcome to our annual football pool. All you do here is pick winners and losers, and guess at a couple of scores each week. Spreads are for suckers. Winners and losers, just like life. If you take first place for the season, you'll win something. What it is yet, I dunno. Lemme dig around my closet of old sports stuff. Last year's prize was a box of cereal from a washed up nobody and a jersey card from the late Steve McNair, murdered in his sleep by a crazy woman. Last year's prizes were won in a tiebreaking paper-football kickoff! Prize details will be posted here as they occur. Anyway, the league doesn't kick off until the first game of the regular season, so you have all of pre-season to truck on over to Yahoo Fantasy Sports and sign up. We're private group id # 19778, and the password is v3. It's totally simple, free, and open to all. Join us in our annual ritual of sports prediction. 2. In the event of a tie, and the tied players are located in Phoenix, players will meet for a pepper-eating contest. If tied players are not all located in Phoenix, each player must submit a photo of themselves in the Heisman pose, holding a live animal of their choice instead of the ball. The commissioner's judgement will be swift, just, and final. Should the commissioner himself be one of the tied parties he will withdraw from the competition so he can judge impartially. This year's grand prize package contains a rare William 'Fridge' Perry G.I. Joe action figure with a spiky football on a stick, only available by mailing in UPC codes from other G.I. 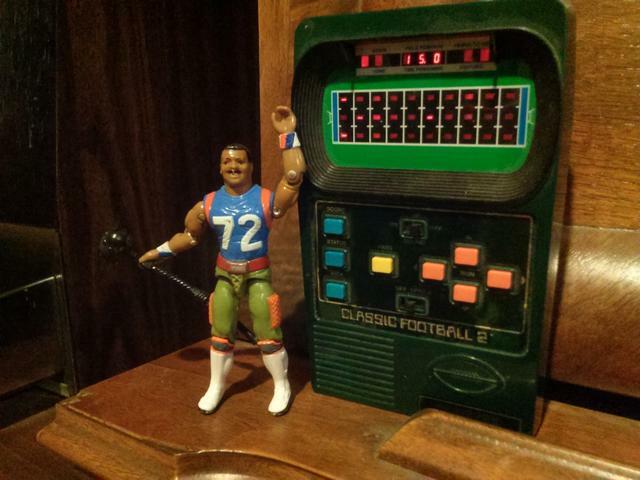 Joes packages back in the early 90's, and a fully functional* Mattel Classic Football 2 handheld electronic game! Hark back to your childhood by scoring this awesome prize package! The season kicks off tonight, best of luck to everyone! * due to the fact that mailing batteries now constitutes some kind of terror threat, if the grand prize package needs to be mailed, it will be shipped without the 2 AA batteries needed to power it. If the prize is won locally, batteries will be included. Good first week, everyone! Congrats to spam_vigilante and Who Dat? who both pulled 11 wins out of the schedule! Next game is Thursday! MAKE YOUR PICKS! Congrats to all for another exciting week, and big ups to SackBlabbath who took sole possession of first place for the week and held onto it through the Monday night game (even though the iggles pulled it out, giving ME sole possession of 2nd for the week!). Bucs-Falcons coming up on Thursday! MAKE YOUR PICKS! DAAAAMN. Now I don't feel so bad that my Saints lost to the falcing Fuckons by 3 points. Still burns to lose to those jerks but at least it wasn't a blowout. Seattle couldn't repeat but Cuando Lo Veas could! Congrats for a great season to all, when the prize package gets delivered there will be pics and stuff here in this thread. Thanks to all for playing, hope to see you next season! *Congrats to Cuando Lo Veas on the repeat! I was hoping to get that prize package this year...it's not often you get a chance to win Refrigerator Perry wearing a giant codpiece and sporting pollen sacs. 2014-2015 NFL Pick'Em: The Desolation of Goodell ** Congrats Cuando lo Veas! ** is locked.